Enjoy ocean views over Ela Beach or Fairfax Harbour, on-site secure underground parking, 24 hour security and complimentary airport shuttle transfers. Please provide airline and arrival details when making your reservation. Accommodations on the Executive Floors include access for in-house guests to the Executive Lounge on the 15th Floor, Breakfast in either the Executive Lounge or Grand Brasserie. Every hotel guest will be treated to unobstructed ocean views over Ela Beach or Fairfax Harbour. Room rates include complimentary airport transfers, please provide airline and arrival details when making your reservation. Our female traveller can enjoy the extra comfort and convenience of dedicated ladies floors within the Executive Levels, available upon request and subject to availability. For that added touch of luxury and sophistication enjoy one of our Grand Suites, either a Grand Junior Suite or Grand Suite, available as individual suites or combine a Grand Suite and Grand Junior Suite for a Two Bedroom Grand Experience. Accommodations on the Grand Floor include access for in-house guests to the Executive Lounge on the 15th Floor, Breakfast in either the Executive Lounge or Grand Brasserie. 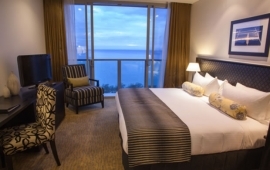 Magnificent ocean views over Ela Beach or Fairfax Harbour and room rates include complimentary airport transfers, please provide airline and arrival details when making your reservation. Premier Rooms feature one king or two king single beds, 32″ flat screen TV, wireless Internet and deluxe amenities. 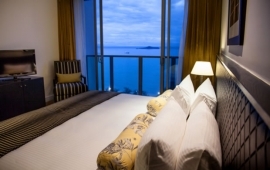 Premier Suites are fully self-contained suites, with bedroom, lounge and kitchen. 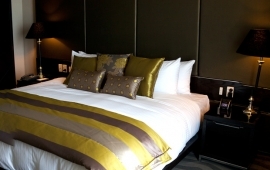 Executive Rooms accommodates two people comfortably, with either a bedding configuration of one king or two king single beds. 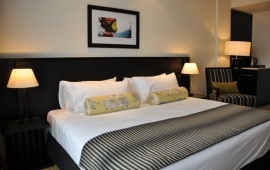 Executive Suites are fully self-contained suites, with bedroom, lounge and kitchen. Grand Junior Suite feature a super king-size bed, 46″ flat screen TV, wireless Internet access, kitchenette and deluxe amenities.